Please welcome my fellow Champagne Book Group author, Olga Godim. Olga is a freelance writer and journalist from Vancouver, Canada. Her articles appear regularly in local newspapers, but her passion is fantasy fiction. Her short stories have been published in Lorelei Signal, Sorcerous Signals, Aoife’s Kiss, and other publications. In her free time, she collects toy monkeys and bemoans Vancouver rainy weather. 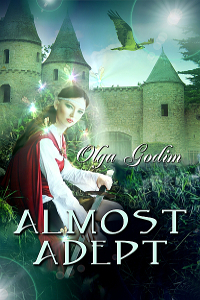 Almost Adept is her second novel. This goal of blogging about different aspects of courage has been enlightening so far. Today, Olga discusses how one person’s view of courage can vary, perhaps drastically, from another’s. As with many things, courage can depend on one’s point of view. She examines this concept as it related to a character in her fantasy novel, Almost Adept. According to a dictionary, courage is “the quality of mind or spirit that enables a person to face difficulty, danger, pain, etc.” When the choice is clear, I agree with this definition. But sometimes, the choice is not so transparent, and the notion of courage becomes dependent on the point of view. What one person or one social group considers courage, another might regard as stupidity, or conformism, or even cowardice. Kealan, one of the protagonists of my fantasy novel Almost Adept, finds himself in such a contradictory situation. Ten years before the novel starts, his small country was overrun by an army of a much more powerful empire. For ten years, Kealan has led the resistance; he fought together with his comrades to free his land. It hasn’t happened, and he is tired of being an outlaw. He has stopped believing that freedom is achievable some time ago. And if they can’t drive the occupants out, maybe it’s better to stop the fighting and learn to survive under the new regime, to find a new direction. Maybe choosing peace over strife is the right course, the brave compromise? Self-doubts gnaw at him. Some of his mates accuse him of betraying the cause, of being a coward. Are they right? Is he indeed a coward and a collaborator? On the other hand, most of the country is moving forwards, trying to forget the horrors of war, to blend with the occupants. Most of Kealan’s neighbors, the local merchants and peasants, want the resistance to disappear, and so does the empire. Both sides want peace now. Would Kealan betray the majority of his people, if he kept the resistance alive? Would he betray his friends if he let it go? The choice he faces is complicated and ambiguous, with no definitive answer, as political courage is often muddled by contingencies and trade-offs. But when he is presented with a simple choice of a warrior, his decision is equally clear. When a group of rabid terrorists kidnaps an innocent child, and the governor threatens bloody retribution, Kealan is willing to sacrifice his life to avert the disaster. Without hesitation, he rushes to the rescue, disregarding his own safety. In the ensuing fight, his personal courage is beyond questioning. Is he an intrepid leader or a cowardly traitor? Or a confused man searching for the right thing to do? It’s for my readers to decide. and other retails of electronic books. Amazing post, Olga, and another book to add to my TBR list…would love to take this journey with Eriale and Kealan. Your book sounds delightful and fascinating, Olga! I’ll definitely be reading it. I used to devour fantasy novels and would love to return to reading such a wonderful genre. Doesn’t it sound good? I really love the magical quality of the cover. It is on my TBR list too! Thank you, everyone, for your kind words. I’m glad Ceci offered me the opportunity to appear on her blog, and with such a multifaceted theme. This post was a challenge and a joy to write. I never really thought before why Kealan does what he does and how it would look to his friends… or to my readers. Sue-Ellen, come visit Vancouver again. In a month, every park and yard and street will spring into bloom, and the flowering state of the city will continue well into the fall. I’ve been living here for 20 years, and spring in Vancouver still affects me. Sometimes courage is carrying on with daily life in the face of disaster. I think of the women in war torn countries who hold their families together and those whose loved one has a terminal disease who manage not to succumb to hopelessness. Ma Joad in Steinbeck’s Grapes of Wrath shows her courage and determination on almost every page. Within courage there is an element of knowing the odds are stacked against you, but continuing on your path nonetheless. John F. Kennedy’s Profiles in Courage shows people doing just that. You’re right. The quiet, often overlooked courage of those who keep going, day after day, holding their loved ones together by sheer determination, is amazing. For some reason, it mostly applies to women. I know of several cases, fictional and real, where dashing men, heroes, return from war and their heroic exploits to the life of drudgery and couldn’t take it. They either start drinking like pigs or spiral into another kind of self-destruction. They were brave in front of swords and guns but couldn’t endure unending poverty and uncertainty. Different types of courage require different character traits, I suppose. As I wrote that post, as I tried to think of examples of courage in daily life, everyone who came to mind was a woman. Maybe that kind of courage has to do with gender roles; men are socialized to be big and brave and face external dangers and women (at least in my generation) were socialized to keep the home fires burning.